Listed in this article are some axioms that I have created as a learning tool. These axioms are reflections of the temptations we face on a daily basis as rottweiler breeders. If one were to make a similar list for any human endeavor, I doubt it would differ much from what I have listed. I think this list is one that we should all review from time to time, for it requires maturity and self-confidence to master-something we all should continue to hone throughout our lives. The ultimate payoff is the ability to succeed in and to enjoy our rottweiler breeding careers. The primary reason anyone becomes involved with dog breeding and showing is a fundamental love of dogs. We treasure the companionship, the never failing loyalty, the delight they exude. We love to have them on our beds. Their eagerness to face the new day, even when we wake them up at dreadful hours, provides us a wonderment that brings back the exuberance of childhood. They forgive us when we lose our temper, when we are impatient, when we are far less than they are. They bring out the best of ourselves, they nurture the "big" us. Unfortunately, dog breeding and exhibiting can tempt our "little" selves. It can feed a fragile ego until it becomes a raging ego. Often, this need to feel we are better than our fellow man is expressed in our possessions. We need to have the biggest winner, the producer of the most champions, the most champion puppies. We buy, we co-own, we collect. Soon we have no time for dog pleasures, no time to play or rub a grateful belly, no time to stroke a patient brow. Soon we have no room for more dogs; we stack them and crate them and store them as though they were baubles that have no meaning but to make us feel important. We lose our ability to love. Dog showing and breeding is a great vocation. It is creative and challenging and very rewarding. But we must never expect our hobby to take the place of a psychologist's work. We must never expect an unhealthy mental state to be cured by self-indulgence. Far too many people take to showing and breeding for the wrong reasons. Their houses go to ruin, their bank accounts evaporate, their credit hits the skids, their spouses and children are left to survive on their own as the breeder pursues their own manifestation of what they perceive to prove their self-worth. Being a dog breeder is a huge commitment. It means we should assign ourselves the role of lifetime student. It means we will be humbled in countless ways and in countless circumstances. It means our lessons will be of the hard knock variety if we are to truly learn them. It means frustration, long hours, late nights and early mornings. It means never getting to sleep-in again. It means finding friendships - some of which will last for a lifetime and some of which will founder, being built on social advantage. It means being quoted and misquoted and having words put in your mouth. It means being given ample opportunity to be as "small" as a human being can be. But, hopefully, it can provide an opportunity to learn to be "big," to be generous, inquisitive, and adventurous. We should never ask ourselves if we are envied or important or successful. Those questions are meaningless. At the end of the day, we should ask ourselves, "Am I proud of the person I've become? What we must always be are dog lovers. We must be their advocates. We must ensure the life of every dog we breed and every dog we own is fulfilled and an illustration of humanity at its nest hour. Our vanity must not be stroked by having our pictures in a magazine or seeing our name on some ranking system. Our self-worth must come from knowing we provide our dogs a life of love, of pleasure, and of happiness. It is easy to become lost in the purpose of breeding quality rottweiler puppies for sale. For some, the attraction of the bright lights, the glamour and the glitz cause them to stray from the path. 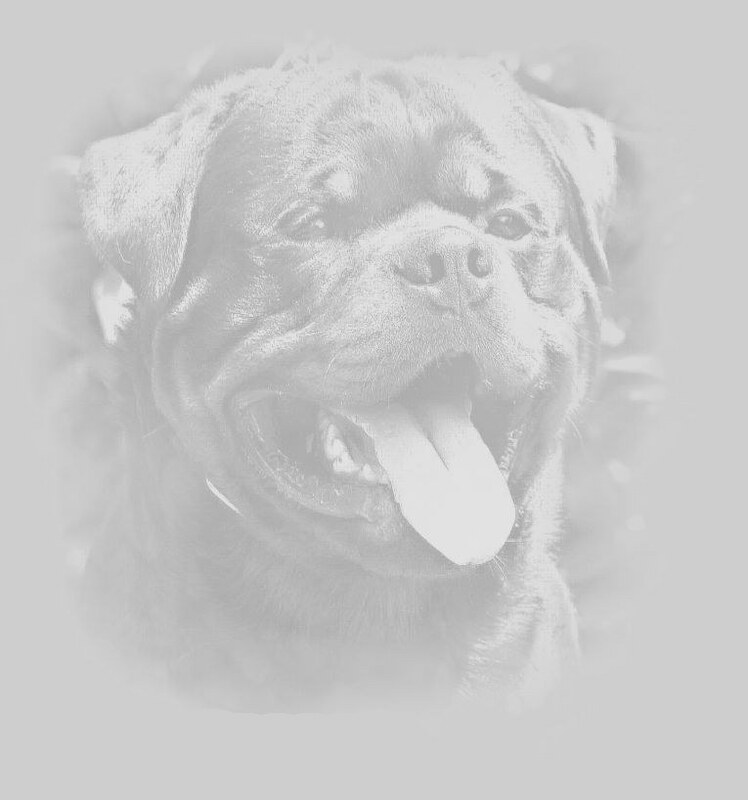 Developing a rottweiler bloodline brand that is well considered and that is a positive influence for the breed takes considerable discipline. Too often, the seemingly slow and carefully orchestrated effort to improve a breed is crossed up with the immediate desire to breed that one big winner and become famous. The breeder's pledge must be to harbor and safeguard the breed. No breed is in perfect shape when the breeder happens upon it and none shall be perfect when they leave. But to leave a breed in better shape than it was when you came upon it is the greatest compliment. To improve type, movement, temperament and health must be the bottom line for every committed breeder. Such accomplishment takes a long-range plan that is carefully thought through. It requires dedication and purpose. All too often, we are sidetracked by our desire to breed to the latest big winner, and then to the next and the next. Before long the pedigree is a long list of "who's who" that have no relationship to each other, other than they found success in the ring. What is key to learn (and to believe) is success in the ring is not an automatic indication of the dog's true quality. We all wish one indicated the other but that is too easy. It would require the removal of human fallacy to be accomplished! Dogs do not excel for all the same reasons. Consequently, you can't simply breed one big winner to another and produce more big winners. Every feature and their nature of inheritance must be studied and understood before you can "manage" the inheritance variables. Once you gain this skill, you are on the road to producing a great line of winners. The breeding of fine purebred german rottweilers should be considered the pursuit of perfection - it is not the maintenance of it. All dogs have faults, all dogs are less than ideal in some ways and areas. If not, the "ideal" has not been well enough conceived. It is very easy to fall into the trap of being defensive about one's own dogs. This usually happens because what we assume to be correct is challenged by another as being less so. This disharmony causes confusion in our mind and ultimately unhappiness. To right ourselves, we often become defensive and try to rid ourselves of that which is causing us the discomfort - namely the opin-ion that does not complement our own. We must realize that "truth" is the ultimate standard by which our decisions should be made. In most cases, a roached back is a roached back, whether we choose to recognize it as such or not. Consequently, the best way for us to not be put into a position of being unhappily surprised is to pursue knowledge relentlessly to ensure our opinion is as accurate and close to the "truth" as possible. This knowledge is gained in many ways, one of which is learning from fellow breeders. We must fight the urge to make up our minds about something and refuse to consider another viewpoint. Indeed, we do not make decisions based on facts when we are first learning, we are depending upon what we perceive to be the expertise of others to provide that for us. If that so-called expertise is, in fact, faulty, our whole knowledge base is called into question. And that causes us great anxiety. The best place to sit is in the seat of the knowledge seeker. Whenever provided with an opinion that is different than the one You currently hold, always seek to under-stand the viewpoint of the other. Why does the person perceive something differently than you? Understanding another's point of view can be the road to greater knowledge. If you shut that door and do not entertain the prospect of learning something different than what you think is truth you will never actually recognize the truth and you will not succeed in your goal. Quite honestly, you should be more critical of your dogs than anyone else could possibly be. That is not to say you should attribute faults to your dogs they do not possess, but your evaluation must be as detailed as possible and you must strive to see clearly their true faults and virtues. From this comes the map to success. Sounds a bit like the golden rule that we learn in childhood. Yet it is amazing how many people forget this very important axiom. In dealing with others, regardless of the matter, think always of the other person's position. I have heard repeatedly, people state how they were burned in a co-ownership agreement. All too often the agreement is geared toward benefiting one party (often the seller) over another. Written agreements somehow are tainted as being only needed in a contentious situation. This is the first misconception. Not having a written agreement should be the very rare exception, not the reverse. Too often, should a worthwhile puppy be produced from one of these undefined arrangements, the fight is on for possession. Before contemplating selling a dog on a co-ownership or leasing it or offering stud service for a puppy back, you should think through what exactly you expect and desire from such an arrangement. Too often, these business dealings occur in the spur of the moment during a telephone conversation, and the deal is struck before either party has really had an opportunity to think it through. For some reason, rather than rethinking the situation, we tend to try to follow through on such an ill conceived arrangement only to end up bitter enemies in the end. If people would stop and think about the likely end result, they would realize the best possible thing to protect the friendship is to have a written understanding. It is very rare a litter is going to have more than one star if any at all. Consequently, it is important to under-stand who is going to own that super rottweiler puppy, should it appear. People are too willing to tear apart relationships should one person seem to benefit a bit more than another. This is too sad and is reflective of the self-benefit motivation that all too many find as the driving force for their actions. When pressed, it is far better to give than to receive. It is far better to let the other seemingly benefit than to destroy a relationship and acquire the reputation of being disreputable and self centered, if for no other reason than it makes you grow as a human being, which is probably a fair trade off in the long run. Another pitfall breeders often experience is the inability to celebrate others' Successes. While certainly we feel the route we are taking is the best way to approach that utopian plateau of breed perfection, there are actually many routes to that same goal. It takes nothing at all away from our own accomplishments to recognize the accomplished efforts of other breeders. This inability and unwillingness to appreciate other's efforts usually comes from having made a decision not to breed to certain bloodlines or deal with certain persons. When such a kennel then produces a success, it is difficult for us to acknowledge such an achievement for we tend to find that inconsistent with our opinion of that particular person or family of dogs. It takes quite an honest and secure person to recognize and celebrate the accomplishments of others. While it is probably good advice to hold our criticisms closer to our chest, recognizing another's achievement only brings good things. By being someone who can see the virtues in breeding lines other than your own, you gain a reputation of fair-ness and objectivity that is a very rare pearl in dogdom. You may find, over time, your point of view and your philosophies are taken with much greater weight when others do not perceive them to have originated in a mind consumed with self aggrandizement. Thus, by doing so you lose nothing and yet you gain so very much. One of the worst situations a breeder can find her/ himself in is to partition themselves off from another kennel or bloodline. It is highly unlikely that all improvements toward the perfection of a breed are going to come from one single kennel or bloodline. Like flowers in the field, they will spring up in various places. The clever breeder is the one who knows how to pick from allthe field those who will make the ultimate, sublime bouquet. And to do this, you must be able to use the strengths of other kennels and bloodlines. Breeders will tend to have certain biases; and quite honestly, there are certain strengths and weaknesses in most bloodlines. While you may feel you have achieved the highest ground in certain areas, there will doubtless be other areas in which your dogs and bloodlines are less strong than others. Not to recognize this fact is to ensure you will plateau quite early in your breeding career. And by that I mean you will stabilize and go no further. You must always keep a watchful eye for that very special bloom that will enhance your bouquet. It is this sophisticated combining of families without losing the good points of your own bloodline that strengthen a kennel and move it forward in breed importance. It takes careful consideration, orchestration and pruning to come to fruition. My last axiom addresses the whole issue of morality. It has many facets and many ways of expressing itself. Spreading rumors, the accuracy of which might be doubtful, is one very good example. Selling dogs on co-owner-ships as a means to control other breeders is certainly another. Accusing other lines of genetic problems while being less than entirely honest about your own is yet another. In all, it goes to the very core of who we are. Do we know right from wrong? Do we practice right in all circumstances? Dog breeding is not about that one great win or that one great winner. It is about breed improvement over time, it is about protecting a breed. Too many people are in search of some kind of sign of their self worth and they think they will obtain some special level of respect and honor if they have a big winner. Dog breeding is a lifetime's work. It is a continuum of which, no matter how quickly you want to "put yourself on the map," will ultimately be a reflection of your true character. To wit, you can't fool all of the people all of the time. There is no honor in "adjusting" reality to give you the appearance of achieving something you have not. Politicking for wins will not make your dogs any better than they are. Faking your dogs will not make them any better than they are. You may think you can fool the world, but you will ultimately pay the price. No one wants to be a pretender. And yet, some of the worst pre-tenders are people who seem to be infatuated with spreading rumors about other people and dogs. These people live in glass houses and invariably they know it. The breeding of dogs is not about how you impress the neighbors, your peers or anyone else. It is the expression of your love of rottweilers and your personal pursuit in creating an art. You cannot lie about the art you create; you cannot lie to yourself. While this list, I am quite sure, sounds like a sermon from the mount, it encompasses the many pitfalls that we dog breeders face every day. Some of us are equipped to navigate these disturbances better than others, but all of us CAN navigate them. We are all tested from time to time, even the most educated, psychologically balanced, intelligent and honest amongst us. There are times when it feels much better to zing someone who has been hurtful, to control those whom we feel do not have the proper motivation, to become the ones who attract the adulation. Only through careful thought and well-considered action can we hope to become better people and therefore better dog breeders. Kennel Blindness: A widespread attitude in many kennels of purebred dogs that is a "disease" which renders a breeder incapable of seeing faults in his/her own dogs. Kennel Blind breeders tend to twist and distort the standard to justify the dogs they breed and the combinations that they use in their breeding programs!! Symptoms of Kennel Blindness: The tendency to ignore the virtues and focus on the faults of a competitor’s dogs. Kennel-blind breeders tend to focus on negative features in dogs that are not their own. Oftentimes, what they view as a fault in someone else’s dog may be an acceptable variation of a style in that breed.